"Trying to shuffle different dishes that require different cooking temperatures on the big day can be challenging. Save yourself oven space and some hassle this holiday season by letting your Instant Pot® do some of the work for you." Whisk 1/2 cup broth and egg together in a mixing bowl. Set aside. Turn on a multi-functional pressure cooker (such as Instant Pot(R)) and select Saute function. Add sausage and cook, breaking up with a spoon, for 3 minutes. Add butter, onion, celery, and water chestnuts. Cook 4 minutes more and turn pot off. Add parsley, salt, thyme, sage, and black pepper. Stir to combine. Add bread cubes to pot and pour egg mixture on top. Toss to combine. Close and lock the lid. Select manual and set the timer for 6 minutes; allow 2 minutes for pressure to build. There will be no pressure to release in this step; when timer is up, carefully remove the lid and add remaining broth. Close and lock the lid again. Select manual and set the timer for 5 minutes; allow 2 minutes for pressure to build. Release pressure carefully using the quick-release method according to manufacturer's instructions, about 5 minutes. Unlock and remove the lid. Remove the lid and transfer dressing to a serving dish. 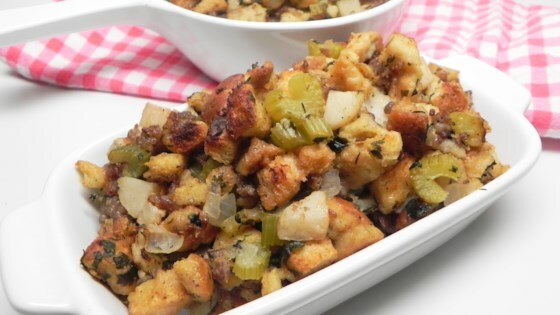 See how to make the perfect Thanksgiving stuffing for seafood lovers. Due to the way the bread absorbs the liquid, it is important that you cook this in two steps as noted. If store-bought stuffing bread cubes are not available, you can easily make your own. Cube 8 slices of bread and place on a baking sheet. Cook for 15 to 20 minutes in an oven set to 300 degrees F (200 degrees C).